Skypersonic takes industrial inspections to a new level. Thanks to its small size and proprietary caged technology, the Skycopter Pro can inspect places no man or machine can reach. Intervene before it’s too late, and do it in the safest possible way. Skycopter Pro can get to dangerous areas and situations and take a close look thanks to its First Person View HD camera. Pipes, tanks, boilers… no place is too tight for the Skycopter Pro. Capture HD videos and analyze structures like never before. A powerful LED system will let you see in the dark. Inspect structures without excess manpower and with increased safety. The Skycopter Pro boasts battery life to 14 minutes to reach distant places avoiding frequent landings. The patented Skycopter Pro's removable cage technology will keep you away from troubles. Get close, hit the walls, touch objects safely to capture images with 0.17mm resolution per pixel. Fly any mission with confidence! The Skycopter Pro's tiltable camera can record 1920 x 1080 video @60 FPS while sending latency-free images to the ground in 5.8 GHz for First Person View flying on a display or goggles. Fly as you are the drone! The Skycopter Pro is born from racing roots. In the world of FPV drone racing efficiency is everything, so every little aspect has been considered with maniacal care to reach the stunning flight time of 14 minutes. FIRST AND ONLY INDOOR GPS SYSTEM IN THE WORLD! Skyloc is a system made of 4 or more receivers (3 anchors and 1 tag), able to generate a GPS signal indoor, underground or, in general, everywhere the classic GPS signal is not available. Skyloc is one of the most versatile positioning systems on the market. The areas of application go from vehicles to agriculture, from industrial plants inspection to hospitals. Skyloc can be a source of multiple benefits. 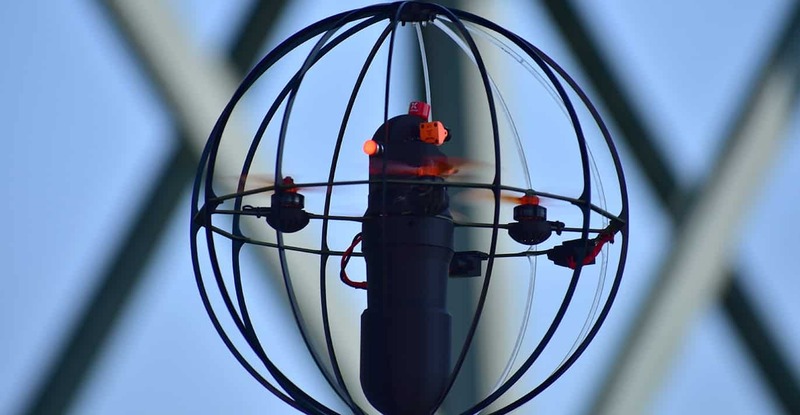 Used in conjunction with the Skycopter caged drone, Skyloc can track its position on the dedicated app’s map in GPS signal-less conditions, such as tunnels, pipelines and underground caves. The system can create a multi-area network thanks to its deep learning engine algorithm. See Skycopter and/or Skyloc in action!